Last weekend, I packed up my spring/summer wardrobe to make room for my fall/winter clothes. Most likely, we'll get a few days of "Indian Summer" before Thanksgiving, but I think it's safe to say the warm, T-shirt weather is over here in the Northeast. It's time for tops with three-quarter sleeves and cozy sweaters. Coincidentally, Pauline Durban, founder and president of Covered Perfectly, wrote to say she had a couple of three-quarter sleeve tops she thought I might like. She wanted to know if I'd be willing to review them on Flattering50. I'm already a huge fan of Covered Perfectly tops, so the answer was an enthusiastic "yes!" 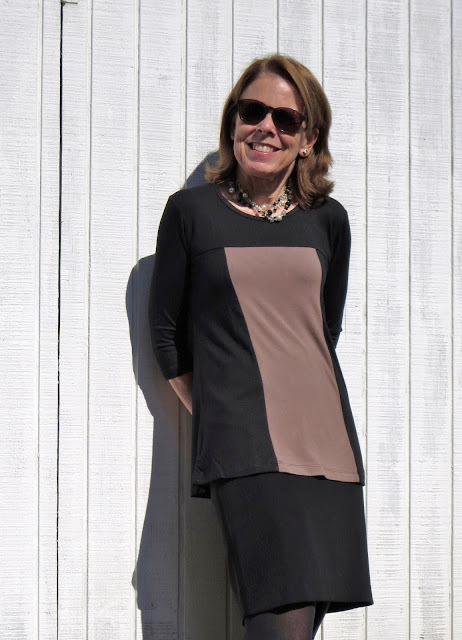 The tops are a flattering choice for women over 50. Pauline also wants to give a Flattering50 reader a Covered Perfectly top of her choice. So...if you like what you see and read in this post, be sure to stop by and enter for a chance to win a top at Flattering50 Giveaway: A Covered Perfectly Top. Or...if you need a new top right away, shop the Covered Perfectly collection and enter the code F50 at check for 20% off on a top. The photo above is of yours truly wearing a Color Block Top from the Covered Perfectly collection. Like many of Pauline's tops, it's made of MicroModal with a touch of spandex. MicroModal is a natural fiber made from European beechwood and produced in Austria. It's a super soft, breathable fabric that really feels lovely on my skin. The minute I put on the Color Block Top I said to myself: "This is the top I'm going to wear on Thanksgiving." It's my turn to host the holiday for my extended family. I'll want to look nice, but will need to be comfortable while working in the kitchen. The Color Block Top is very stylish and its breathable fabric will keep me comfortable while I baste the turkey and stir the giblet gravy. I also love the Color Block Top's below-the-hips length. Overall, it has just the right amount of fabric: a little extra, but not enough to look like a maternity top. And I'm a huge fan of color blocking with a vertical color panel in the center and black fabric on the sides--it's so slimming! It's the perfect top for holiday gatherings, weekend outings, and office work. I know I'm going to be wearing it a lot. The Color Block Top comes in three different color combinations: Black-Coral, Black-Malt (that's the one I chose), and Black-Red. It's available in sizes S-XL and Plus Sizes. I asked for a size small and I'm very happy with the fit. Houndstooth prints made a comeback a couple of years ago and I'm glad they did. Why? The classic print makes a great skirt for the office. Who knew it could also make a great top? Pauline has taken the classic print and turned it into a versatile, stylish top with three-quarter sleeves. Since I'm writing this post on the weekend, I've styled the Simple Comfort Pattern top with black jeans and a biker jacket. However, I know I'll be wearing this top under blazers and cardigans for work as well. The Simple Comfort Patterned Top, which is made of Polyester and spandex, follows my shape without being too clingy. I chose a size small in this top and found it was true to size. However, the Covered Perfectly website says the style "runs small" and recommends shoppers go up a size. In addition to a houndstooth pattern, The Simple Comfort Patterned Top is available in Black-Leopard, Black-White-Animal, and Blue Leopard. And remember: If you plan to shop at Covered Perfectly, enter the code F50 at check for 20% off your first top.